Dodgy claims about where they source their products, dodgy copywriting. Got a lot of nerve setting up shop right across from Muji. Until they at least clarify who makes their "Lamy same manufacturer" pens (hint: it's not Lamy), I'm going to stay far, far away from this company. Also, maybe spend some of your profit margin and hire a copywriter. I might seem unnecessarily harsh and sour on IUIGA, but there’s a reason for it. IUIGA’s business is essentially built on two ideas: 1. “cutting out the middleman”, 2. price transparency. Note on everything that follows: I’m not a business operations or supply chain expert, just a consumer who likes to make well-researched decisions. Just about every company that has started in the Internet age believes in “cutting out the middleman”, to the point that the term has become nearly meaningless. Traditional retail had so many middlemen because each middleman connected different markets to one another, and that ability to connect markets represented value that had to be reflected in the price. If you were in Singapore in, oh, I don’t know, 1850, and you wanted a Faber pencil, you could use your time and resources to travel to Stein and get it from the Fabers yourself, or — I don’t pretend to know what distribution channels in 1860 were like, but I can make a stab at it — you could obtain one through a network of middlemen who connected manufacturers of writing implements to users of writing implements. Distribution networks don’t form by accident; they form to fill a need. In the past, the many middlemen weren’t just buying and re-selling at high prices; they were connecting and expanding markets. The current crop of companies that claim to “cut out the middleman” are often not cutting out the middleman, they are more often consolidating the services of what were formerly multiple middlemen, and they can do that because the speed and ubiquity of modern communications and transportation infrastructure allows them to do the work that would formerly have required the time and knowledge of several middlemen. Additionally, the larger the scale of manufacturing or production, the larger the market needs to be, and the more middlemen are required anyway. The apple farmer is too busy farming apples to be selling them to everyone who wants apples (unless it’s at farmer’s markets, in which case either you or the farmer is paying some other kind of cost in money, time or quality). The shoe factory is too busy making shoes to be selling individual shoes to people who walk in the door: you better be leaving that place with a shipment container. Companies that actually manufacture and sell directly to consumers invariably command a premium relative to their competitors. They have to. These are companies that don’t have to expend a lot of time and energy on marketing, because they fill a particular market niche and consumers actively seek them out, which reduces their need for middlemen to expand their market for them. It may be hard to believe that a company like Tom Bihn, who sells their Synapse 25 daypack for US$200, is selling their products at a reasonable price: you could buy five daypacks at your local big box store and have money left over for ice cream. However, if you could buy Tom Bihn bags at your local big box store, the Synapse 25 would cost more than US$200 and nobody who didn’t already know about Tom Bihn would buy them for that price anyway. Companies that don’t manufacture anything that keep prices low by “cutting out the middleman” are the middleman. They have to be. So few Internet companies with this business model acknowledge this. I don’t have a problem with companies being middlemen, as long as their mediation between the manufacturer and the customer represents value. The value that middlemen provide is a combination of scale, time and knowledge: they place larger orders than consumers do, they do part of the legwork of getting the product from the manufacturer to you, and they know the supply chain better than you do. This last advantage is the space that IUIGA plays in. Like everyone else, it was a dilemma when we shop for home products - we often had to choose between premium brands that were exorbitantly priced or mass-market brands that were ubiquitous in quality and design. As consumers ourselves, we were frustrated with the lack of a middle ground. We were floored by the excessive markups, and we wanted an alternative where we can have quality at an affordable price. We searched for a brand that offered home essentials worth waking up to, but we couldn’t find one that that meets our expectations, so we created IUIGA: thoughtfully-designed and premium quality everyday goods at completely transparent prices. IUIGA’s unique selling proposition isn’t just that they offer high-end quality at mid-range prices. If that were the case, consumers would want to know what the catch was: how can they possibly charge less for the same quality? The answer, of course, is that IUIGA marks up their products less than their competitors. IUIGA tells you what each item costs them, so you know what their markup is (as a rule, they cap their markups at 40% of cost price). Next to their price breakdown, they state the “traditional retail” price of these items. So this is the magic: IUIGA can offer high-end quality at mid-range prices, because they know the supply chain better than you do. The “traditional retail” price is what the big-name brands sell their products for, and IUIGA offers the same quality products for much less. If it’s good enough for WMF and Zwilling, it’s good enough for IUIGA, right? And the markups from the brand-name companies, that’s just pure profit for them, right? I think it’s important to understand here that WMF and Zwilling understand quality because they manufacture, and have done so for a long time. We associate these brands with quality because they have built up their brand equity over decades or centuries. When they outsource manufacturing to another factory and put their name on the products that come out of that factory, that is not a trivial act. When a younger company, with less institutional experience in distinguishing design or manufacturing quality, and no track record of selling quality products, advertises its products as coming from specific factories that manufacture for brand names that they explicitly name, they are piggybacking on the brand equity that other companies have worked hard to earn, and are in a sense outsourcing their quality control to these companies. 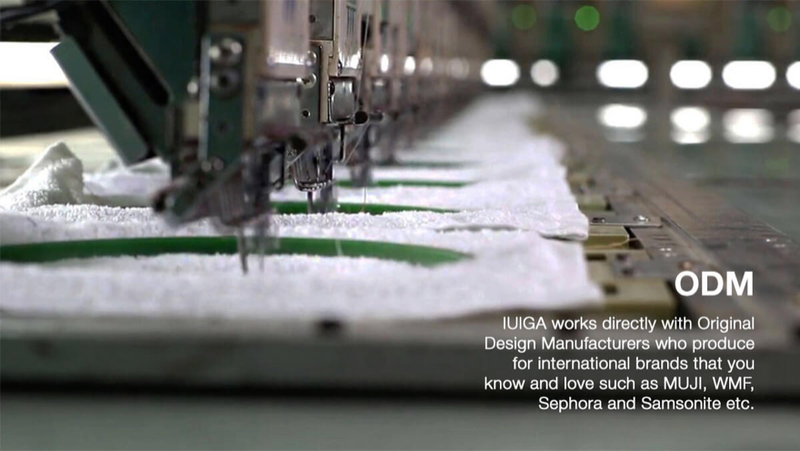 IUIGA visits the factories themselves and IUIGA doubtless has some form of quality control in place, but if the factories did not also manufacture for big names, would IUIGA be able to identify them as quality manufacturers? I have my doubts, for reasons I’ll outline shortly. Whether you feel that the institutional knowledge that companies like WMF and Zwilling have built up, that allows them to vet and select factory partners to work with, that gives them the confidence to put their names on products coming out of these factories — whether you feel that’s worth paying WMF’s and Zwilling’s markups for, that’s up to you. I must also add here that IUIGA is hardly unique in conducting business this way. Lots and lots and lots of companies place orders with Chinese manufacturers, stick their own logo on the products, and sell them at a markup. 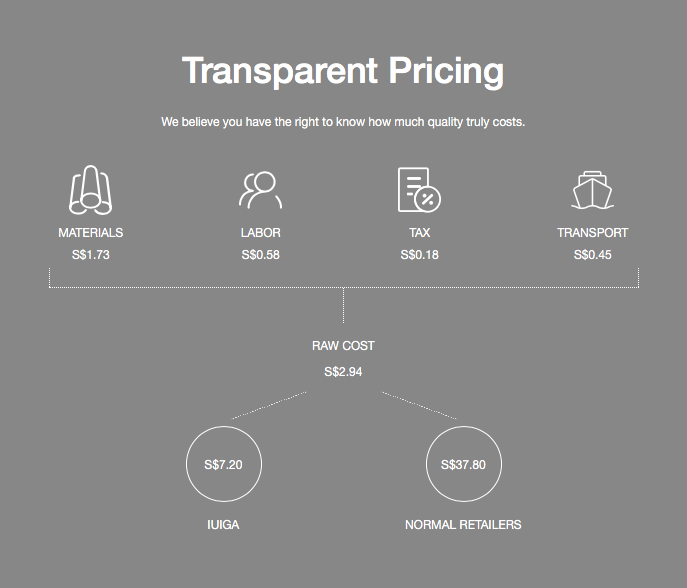 In this respect, IUIGA’s innovation is their price transparency policy, not their sourcing. IUIGA may be a younger company, but is it really fair of me to say that they don’t have enough chops to tell good quality from bad, independent of brand name? Here’s the thing: Hero is a well-known manufacturer of pens. They’ve been around for a long time, and they do make good fountain pens. I don’t think anybody would have had a problem with IUIGA saying from the beginning that their pens were manufactured by Hero, if that’s what’s going on. 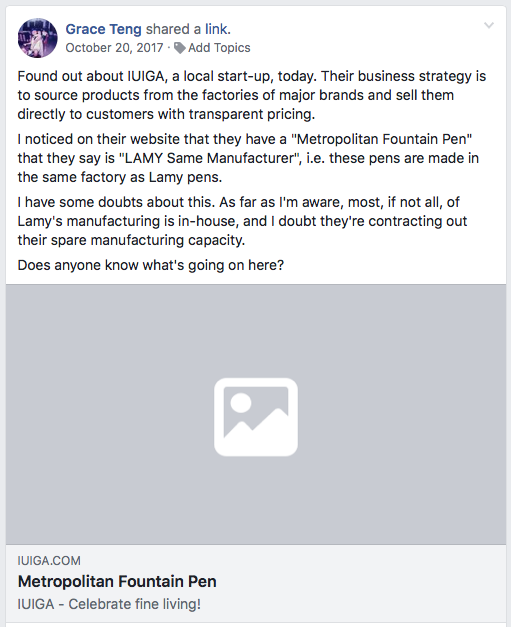 IUIGA kept the “Lamy Same Manufacturer” claim up for months before they changed it to “IUIGA Exclusive Manufacturer”. If it’s an IUIGA exclusive, where does the "traditional retail" price come from? You’ve seen the Lamy Safari. The Lamy Safari is one of the most iconic fountain pen designs, and it’s also one of the most widely distributed fountain pens. Many bookstores, stationery stores and department stores have a Lamy tower or display, and if they do, it’s a given that the Lamy Safari will be in it. Our examination of a number of Hero 359s, it is clear that the manufacturing quality is inferior to the Safari but it is debatable whether most users would notice or even care? Finally, the initial impressions of our members were that they were very pleased with the writing performance of the 359; in fact, most were surprised at the quality of the writing experience relative to the cost of the pen. Is it a Safari – no. Nevertheless, the Hero 359 is perfect if you need to save a bit of money, want a pen for your children to practice with or for use in situations where the pen might get broken or lost. The Hero 359 looks a lot like the Lamy Safari. The nibs are even interchangeable. For me, that’s where the positive comparison stops. Heidelberg has nothing to fear from Shanghai. Whilst [the differences between the Lamy Safari and the Hero 359 Summer Color] are minor differences, they make the Hero Summer Color look pretty shoddy compared to the Safari. The Hero is also just not as well built as the Safari. The plastic is flimsy and low quality, the finish isn’t as good, and there were marks all over the place from the manufacturing process. This discussion isn’t about whether Hero is infringing on Lamy’s intellectual property — that’s a whole other conversation. This is purely about whether Hero’s manufacturing quality holds up to Lamy’s, and it does not. Fountain pen fans generally agree that the Hero 359 is worth the few bucks you pay for it, but it in no way compares to the substantially more expensive Lamy Safari. 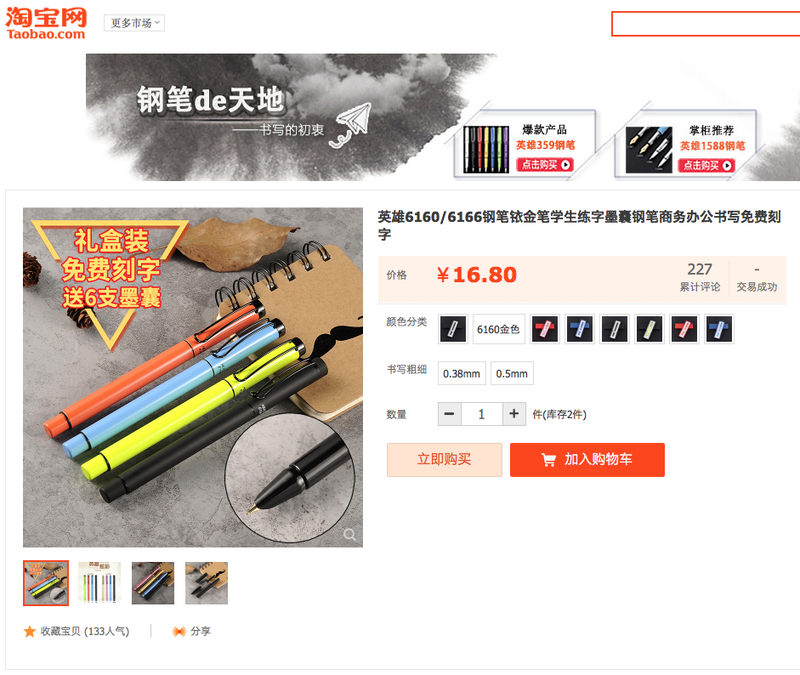 It is disingenuous, then, for IUIGA to compare the low cost of their Benjamin and Alexander pens with the “traditional retail” prices of the Lamy Safari and Lamy Vista. They are not comparable in quality, and that difference is at least partly reflected in the price. It turns out that while you don’t always get what you pay for, quality does cost money. Caveat emptor. Oh yeah. Here’s the Aliexpress link to the Hero 359 again, if you want to cut out the middleman and get your pen for US$3.68 with free shipping to Singapore.